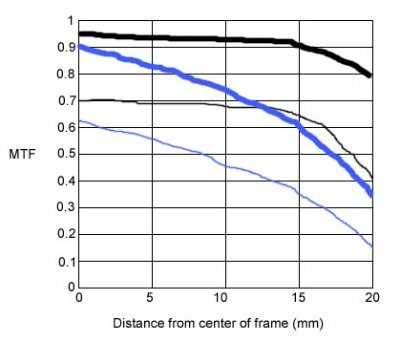 What is the assumption about the brightness response curve of the camera sensor? Is it assumed to be or measured to be linear? No in-camera sharpening? etc. E.g., a camera sensor with a binary response, i.e., that recorded white for every pixel above a certain brightness and black for everything below that threshold, would change the MTF. A very good point, John, and as best I know we can’t put a number on that or graph it, at least not very accurately. I always have looked at the stuff I do as sort of a screening: we want adequate resolution but that, in and of itself, isn’t everything. The critical distinction between sharpness and micro-contrast is tonal separation — the ability of a lens to distinguish between tonal values in order to render the appearance of depth. We are not talking about black against white, but rather subtle differences in shade. I have noticed this is especially apparent in the shadow tones of digital captures, which can be rendered “flat” by modern lenses. Whether this can be measured I don’t know, however I can clearly see it in a direct comparison between images I have shot with different lenses of the same focal length in the same real-world scene & lighting with the same camera. I think terminology is always a problem in discussions like these. Separating sharpness into acutance and contrast is a good first step. Micro-contrast is a term that I always ask people to define when they start using it. Some consider microcontrast to be the same as resolution – how fine of a detail can the system resolve. Others (trying to explain it in words is difficult) are considering it how contrasty a given fine detail is. I tend to like the latter definition, just because, well, we already have resolution. As to 3-D pop being snake oil, no, I don’t think so. On the other hand it may be difficult to measure numerically, and unless everyone agreed on what they mean by ‘microcontrast’ there’s no way to measure it at all. Thank you, Roger, for the wonderful write-up on MTF, resolution, and acutance. I learned a lot today! Many people refer the term microcontrast as the ability of a lens to transfer contrast of very small details. And they also claim that Zeiss prime lenses have more “3-D pop” because of high microcontast their lenses have EVEN if their resolution is lower than comparable Sigma, Nikon, Canon counterparts. This view is certainly in conflict with what you presented here as you referred resolution as microcontrast. A blogger calls Sigma ART lenses (known for their very high resolution) produces flat images because their lack of microcontast (http://yannickkhong.com/blog/2016/2/8/micro-contrast-the-biggest-optical-luxury-of-the-world). 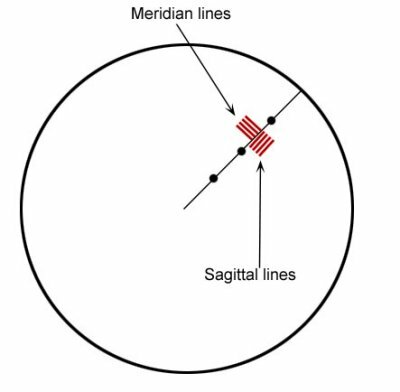 The author said “Unlike measurable resolution, micro-contrast is perceptible not measurable.” Clearly, he is using the term microcontrast to mean depth perception, completely different than what you described here. Is the 3-D pop claims by Zeiss users nothing more than snake oil? Or it is something measurable? I read that post and I actually do agree with it. MTF, which I play with, measures one aspect of a lens – it’s ability to resolve (both in contrast and resolution). That’s very important but depending upon the photographer, subject, and technique, it may not be the most important and it’s not the only factor. One thing I’ve found is sometimes (not always, but sometimes) the designer DOES trade off some resolution in order to achieve a flatter field, lower a certain type of aberration (which might improve booked), etc. Then again, a great designer often doesn’t always have to make that compromise. So I can certainly agree that you might prefer a lens with flatter field or less astigmatism to a sharper lens with a curved field and more astigmatism. Or whatever. However, I do get a little nauseated when the marketing department has to use BS terms. It’s funny how one company waxes poetic about their 3-D look, the goal of all photographers. And another waxes poetic about their 2-D look the goal of all photographers. Etc. I agree with their facts, I get rather insulted when verbiage suggests I can’t understand the complicated optical stuff, I should just go make pretty pictures. Roger, thank you very much for your blog, it’s so informative! Are you going to test Fuji lenses one day? 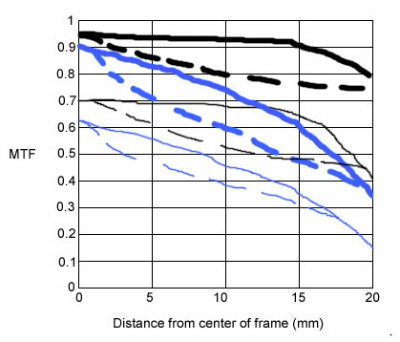 It’s no brainer that 15l/mm and 45l/mm graphs are not enough to determine whether the lens is good or bad. But I don’t like they don’t provide any MTFs proving the lens is good indeed, instead they just add some text. All in all it sounds like there is some magical image quality which can’t be measured which is of course untrue. Also their argument about “two dimensional subject” is weak I suppose. Also there are many lenses which don’t compromise on image border quality. Could you please comment on their post? It would be very interesting if you would test this lens one day to check whether it’s results are much better when focused on close objects comparing to infinity and provide some detailed MTF graphs. Thanks for the quick reply. Please forgive me if my phrasing is odd, since english is not my first language. And later in that paragraph, for a high pixel-density camera (36 megapixel full frame), the pixel width is about 4.8 microns. So the fine line pair to identify the resolution limit should be close to the pixel width. Is my understanding correct? Dee, Brandon’s not around tonight so I’ll tackle most of the question and let him get into Fourier Transformations. MTF does give us a measure of both, if I understand your comment properly. The 10 line pair data correlates well with what we would call contrast or ‘punchiness’ in the photograph, AKA acutance. We like for the 10 lp MTF to be up above 0.90. You can sharpen and image and increase acutance pretty well, though. For most cameras the 30 line pair data correlates pretty well with resolution or fine detail. The point at where the 30 line pairs /mm graph crosses under 0.5 is where (on most cameras) you are beginning to lose fine detail that you just can’t get back. That’s more to do with resolution. That being said, for a high pixel-density camera, like a 36 megapixel full frame or 24 megapixel crop sensor, the 40 or even 50 line pairs / mm data may be a better measurement of absolute resolution. That’s the plain English version, which, as verbiage must when explaining mathematics, contains some generalizations. I’ll let Brandon give a more mathematical and accurate explanation later. Thanks for your post. It’s really helpful for better understanding the concepts of sharpness and mtf for a rookie as myself. I’m still a little confused on separating resolution and acutance on 30 line/mm MTF chart. Since worse acutance means the edge between black and white drop slower, which is one of the impact factors to lower contrast for tighter line pairs (reduce mtf). To me, mtf is an indication for resolution and acutance combined together, isn’t it? I also read in some books that people measuring mtf by taking Fourier Transform of line spread function. It is equivalent to to take more data points in frequencies (line pair) at certain location instead of just two points (10 l/mm and 30 l/mm) as shown in mtf chart? Richardson, W.H., “Bayesian-Based Iterative Method of Image Restoration”, J. Optical Society America, 62, 55, (1972). Lucy, L.B., “An iterative technique for the rectification of observed distributions”, Astronomical J., 79, 745, (1974). To a gray scale image, value = 128, add bright bars with value = 220 and dark bars with value = 30. Then blur with Gaussian blur. Now try and restore the image with unsharp mask. The result will not be pretty. Black and white bars are not a realistic imaging scenario, not even with zebras. I’m wondering how easy would it be to see MTF differences in your photographs. As I understand, digital cameras first blur the image (to prevent aliasing), and then sharpen it in post-processing. So if you look at the RAW image with no sharpness enhancement, then everything will look blurry. If you look at sharpened RAW images (which is what most people use), then differences in acutance might have been removed by the sharpening process. So how do you properly test your lens for sharpness? I was wondering if there’s any easy way to relatively convert between the MTF50 numbers you typically post in your articles, and the values in the MTF charts that the manufacturers provide? I tried posting elsewhere on a forum and got a 1200+ word essay “answer” on how Canon’s MTF charts are done (included mention of Airy Discs and comments asking if I know how to read an MTF chart or not. The general gist I’ve gotten is that either they’re two different systems and I shouldn’t be trying to compare them, or I don’t want to know the math involved. This is really a great post on MTF chart. I have found your site from a forum and read your blog from 2012 till now. Really enjoyed it.